“I am able to be me today because of M.E., because of Medgar Evers and his fight for civil rights,” says Renee in Medgar Evers: He Taught His Kids To Crawl So We Could Stand by Katina Rankin. One day Renee asked her sister, Alexis, why she was crawling on the floor. Renee discovered that there was more to the act and how this act held the history behind the life of Medgar Evers and his journey for the equality of blacks. As Maw Maw Peggie began to share the history behind the injustices that Medgar saw and experienced, he knew that something needed to be changed. Medgar was killed due to his fight for justice. 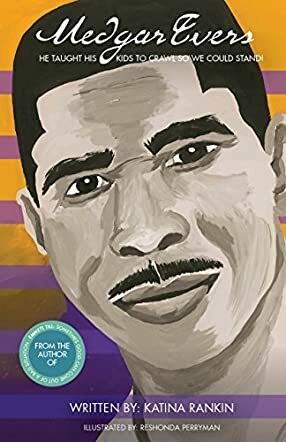 Young readers will see the pride and hope that can occur when you stand up for something not only like Medgar Evers, but like former major league player Colin Kaepernick. Books written by Katina Rankin are excellent for your children's library due to their educational value. I have read and enjoyed several of her books from March On Children! The Story Of James Meredith’s March Against Fear to Emmett Till: Sometimes Good Can Come Out of a Bad Situation, both of which offer an abridged version of history that must continue to be shared, told and kept alive. Like in her other books, Katina Rankin does an excellent job in demonstrating ways to invite children to learn about the past. Our children must know that there are others outside of Martin Luther King Jr, Malcolm X and Rosa Parks to blaze the trails of the lives that we live today. In this book there is a lot for your children to learn about and how history impacts their lives.